To grade a coin means to evaluate it based on the amount of wear it has. The two most basic ways of describing a coin’s wear are uncirculated, meaning a coin that has no evidence of wear from circulation (used in everyday transactions), and circulated, meaning a coin that has some degree of wear (ranging from a barely-discernible rub to decades of wear that has virtually destroyed the coin’s design). While there are established systems and processes for grading a coin, it is ultimately a subjective conclusion. One grading service may assign a coin at a higher or lower grade than another service based on the amount of wear a particular grader perceives. The details of the coin were clearly defined and it retained a luster near its original mint state. As the market for coin collecting grew throughout the late 19th and early 20th centuries, it became clear that a more comprehensive grading system was needed. Some coins graded as “fine” were obviously more fine than others, and some “uncirculated” coins had more luster and detail than others. Terms such as Very Good, Very Fine, Extra Fine, Almost Uncirculated, and Gem Uncirculated began to enter use among collectors as ways of more precisely describing the condition of a particular coin. In 1948, a well-known numismatist, Dr. William Sheldon, attempted to standardize coin grading with a 1 to 70 grading scale. The Sheldon Scale, as it became known, serves as the basis for today’s professional coin grading services. The original scale is included below. In the 1970s, the American Numismatic Association adopted a modified version of the Sheldon Scale that is included below. 1 Poor Never Abbr. Clear enough to identify, date may be worn smooth with one side of the coin blanked. Coins that are very badly corroded may also fall under this category. 3 – 3.5 About Good, Almost Good AG Readable lettering although very heavily worn. The date and design may be worn smooth. 4 Good G, G4 Rims of the coin are slightly worn, design is visible, but faint in areas, with many parts of the coin worn flat. Peripheral lettering nearly full. 6 Choice Good G+, G6 Rims of the coin are complete. Peripheral lettering is full. 8 Very Good VG, VG8 Slight detail shows, with two to three letters of the word LIBERTY showing in coins with this feature. 10 Choice Very Good VG+, VG10 Slightly clearer design-features, with five or possibly six letters of the word LIBERTY showing in coins with this feature. 12 Fine F, F12 Some deeply recessed areas show detail. All lettering is sharp. The letters in the word LIBERTY show completely in coins with this feature, but may be weak. Moderate to considerable, but even wear throughout the coin. 15 Choice Fine F+, F15 Slightly more detail in the recessed areas of the coin. 20 Very Fine VF, VF20 Moderate wear on the higher surface features. 25 Very Fine VF25 All lettering and major features are sharp. Light to moderate, but even wear is seen on the surface and high points of the coin. 30 Choice Very Fine Ch.VF, VF+, VF30 All lettering and major features are sharp. Light, but even wear is seen on the surface and high points of the coin. 35 Choice Very Fine Ch. VF, VF+, VF35 All lettering and major features are sharp. Light, but even wear is seen on the surface and high points of the coin. Traces of mint luster may show. 40 Extremely Fine/Extra Fine Ex. Fine, EF40 Overall sharpness. Light wear seen at the highest points of the coin. Details of the coin are sharp. Traces of mint luster may show. 45 Choice Extremely Fine Ch. Ex. Fine, EF45 Slight, overall wear is seen at the highest points of the coin (examples being raised features). All the details are full and very sharp. Mint luster may show only in protected areas of the coin’s surface (Such as between the star points). 50 About Uncirculated/Almost Uncirculated AU, AU50 Traces of wear at the highest points of the coin. At least half of the original mint luster remains. 55 Choice About Uncirculated Ch. AU, AU55 Three-fourths of the original mint luster remains. 60 Mint State 60 MS60 Unattractive, dull or washed-out, mint luster typify this coin. There may be many large detracting contact marks (bag nicks), or damage spots, but absolutely no trace of wear. There could be a heavy concentration of hairlines, or unattractive large areas of scuff-marks. Rim nicks may be present, and eye appeal is very poor. Copper coins may be dark, dull and spotted. 61 Mint State 61 MS61 Mint luster may be diminished or noticeably impaired, and the surface has clusters of small contact marks throughout. Hairlines could be very noticeable. Scuff-marks may show as unattractive patches on large areas or major features. Small rim nicks, striking or planchet defects may show, and the quality may be noticeably poor. Eye appeal is unattractive. Copper pieces will be generally dull, dark and possibly spotted. 62 Mint State 62 MS62 Impaired or dull luster may be evident. Clusters of small marks may be present throughout with a few large marks or bag nicks in prime focal areas. Hairlines may be very noticeable. Large unattractive scuff-marks might be seen on major features. The strike, rim and planchet quality may be noticeably below average. Overall eye-appeal is generally acceptable. Copper coins will show a diminished color and tone. 63 Mint State 63 MS63 Mint luster may be slightly impaired. Numerous small contact marks, and a few scattered, heavy marks may be seen. Small hairlines are visible without magnification. Several detracting scuff marks or defects may be present throughout the design or in the fields. The general quality is average, but overall, the coin is rather attractive. Copper pieces may be darkened or dull. 64 Mint State 64 MS64 Coin has good, overall average luster and even strike for the type. Several small contact marks in groups, as well as one or two moderately heavy marks may be present. One or two small patches of hairlines may show under low, (3-4x) magnification. Noticeable, light, scuff marks or defects may be seen within the design or in the field. Attractive overall quality with a pleasing eye appeal. Copper coins may be slightly dull. 65 Mint State 65 MS65 Coin shows an attractive high quality of luster and strike for the date and originating mint. A few, small, scattered, contact marks, or two larger marks may be present, and one or two small patches of hairlines may show under (5x+) magnification. Noticeable, light, scuff marks may show on the highest points of the design features. Overall quality is above average and eye appeal is very pleasing. Copper coins have full luster with original or darkened color. 66 Mint State 66 MS66 Coin has above average quality of strike and full original mint luster, with no more than two or three minor, but noticeable, contact marks. A few very light hairlines may show under (6x+) magnification, or there may be one or two light, scuff marks showing on frosted surfaces or in the field. The eye appeal must be above average and very pleasing for the date and originating mint. Copper coins display full original or lightly toned color. 67 Mint State 67 MS67 Coin has a sharp strike with full, original luster, May have three or four very small contact marks and a single, more noticeable, but not detracting mark. On comparable coins, one or two small single hairlines may show under (6x+) magnification, or one or two partially hidden scuff marks or flaws may be present. Eye appeal is exceptional. Copper coins have lustrous original color. 68 Mint State 68 MS68 Coin has a sharp strike with full original luster, with no more than four, lightly-scattered, contact marks or flaws. No hairlines or scuff marks show. Copper coins have lustrous original color. Eye appeal is exceptional. 69 Mint State 69 MS69 Coin has a sharp strike with full original luster, with no more than two small non-detracting contact marks or flaws. No hairlines or scuff marks are visible. Eye appeal is exceptional. 70 Mint State 70 MS70 The perfect coin, as minted. It has no trace of wear, handling, scratches or contact with other coins from a (5x) magnification. Coins in this grade are almost non-existent in older coins with very few examples known. Copper coins are bright with full original color and luster. Eye appeal is exceptional. In the 1980s, professional grading services emerged in response to the need for buyers and sellers to agree on a coin’s grade. The most prominent services in the industry are Professional Coin Grading Service (PCGS), Numismatic Guaranty Corporation (NGC), Independent Coin Graders (ICG), and American Numismatic Association Coin Service (ANACS). For a fee, these professional grading services carefully examine a coin’s condition to assign a grade, determine its authenticity, and encapsulate it in a clear plastic holder, which protects the coin from future damage. An encapsulated coin is more desirable to collectors, as it ensures that the coin has undergone the grading process by an industry professional. The distinctions between coin grades can often be difficult to determine to an untrained eye. 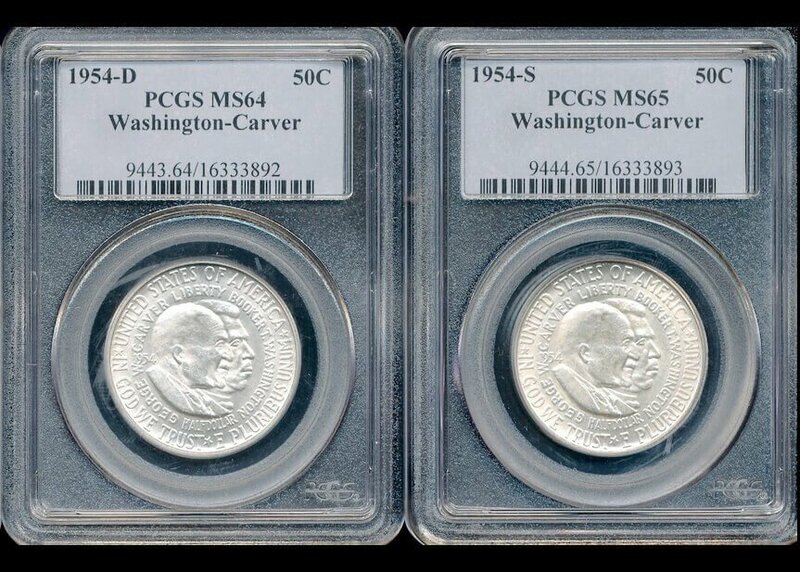 For instance, a coin graded as MS65 has a considerably higher value than an MS64, but as shown below, the difference between the two can be nearly imperceptible without years of practice and training. The American Numismatic Association offers training in coin grading through seminars for beginner to advanced levels. Additionally, they publish a book on the art of grading, Official ANA Grading Standards for United States Coins, that is an excellent resource for beginners and professionals alike. Each of these coin grading services take significant precautions to prevent tampering with the capsules, including photographic and serial number verification for every certified coin. Despite these efforts, counterfeit coin holders have been reported. While a purchase of a professionally graded coin does not completely eliminate the risk of being sold something that is not as advertised, recognized grading standards do offer some peace of mind to an untrained collector.